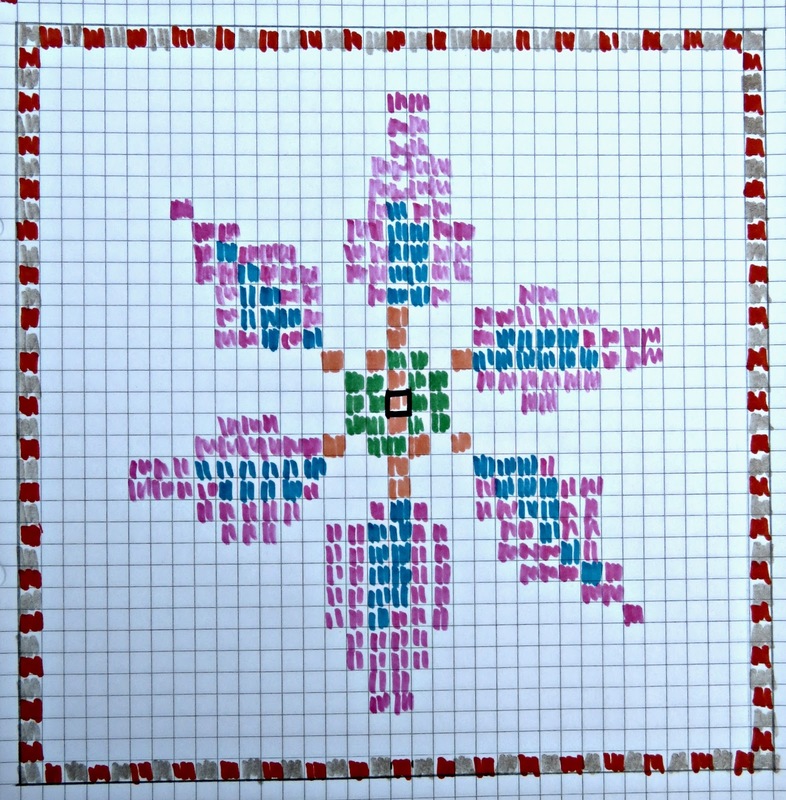 I've worked this design half cross-stitch on a 10 mesh interlock needlepoint canvas using 4 ply tapestry wool. I started from the black-lined square in the centre, and counted stitches from there to fill in the other colours. I finished off the white background in dark green thread. When I'd finished the tapestry I trimmed the canvas to 1 cm of the stitch work, cut out a square of the same dimensions in short-pile velvet for the back. I found a dusty pink velvet at my local fabric store, Ealing Fabrics, that was perfect for the job. And, as luck would have it, the lovely lady behind the counter was able to pull out an upholstery trim that was a great match for the backing velvet. Having overlocked the edges of the velvet I sewed it to the tapestry, right side to right side, around 3 of the sides of the square that they created. Then I turned the work so that the right sides were out, and the worked seams were inside. 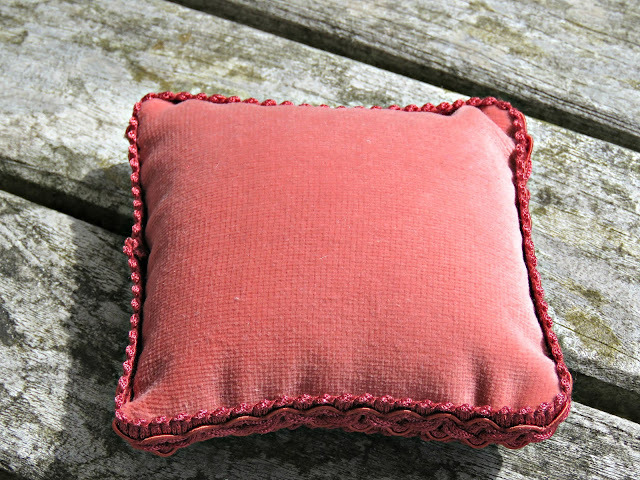 I stuffed the cushion with some toy stuffing and sewed up the final side of the square. Now the only thing left to do was attach the upholstery trim around the edge. 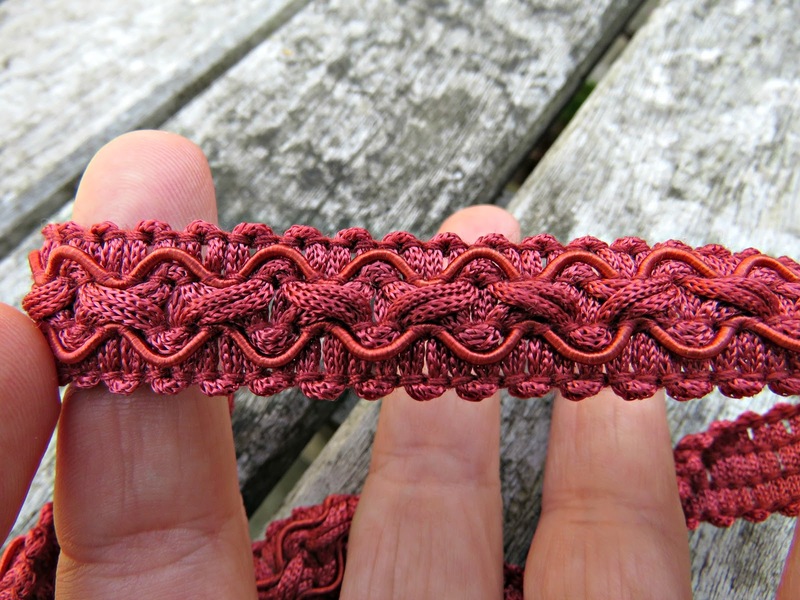 This type of trim is known as gimp braid, and it's got a marked tendency to unravel. I tried to end-stitch it, overlocking the ends to keep them intact, but my efforts were a bit of a failure. The only way in which I could keep this braid together was by securing the ends with a fabric glue. Using a paintbrush I dabbed some fabric glue, front and back, on the cut ends. The glue dried clear, so it wasn't very noticeable where the fabric had been treated. I sewed the braid around the cushion using an invisible stitch, taking small stitches from the wrong side of the braid, and sewing those to the cushion, pulling the thread taut after each stitch to pull the braid against the edge of the cushion. When I got right round to where I'd started I finished off the trim with a little bit of fabric glue so that it overlapped slightly, and sat snugly on top of where it started. 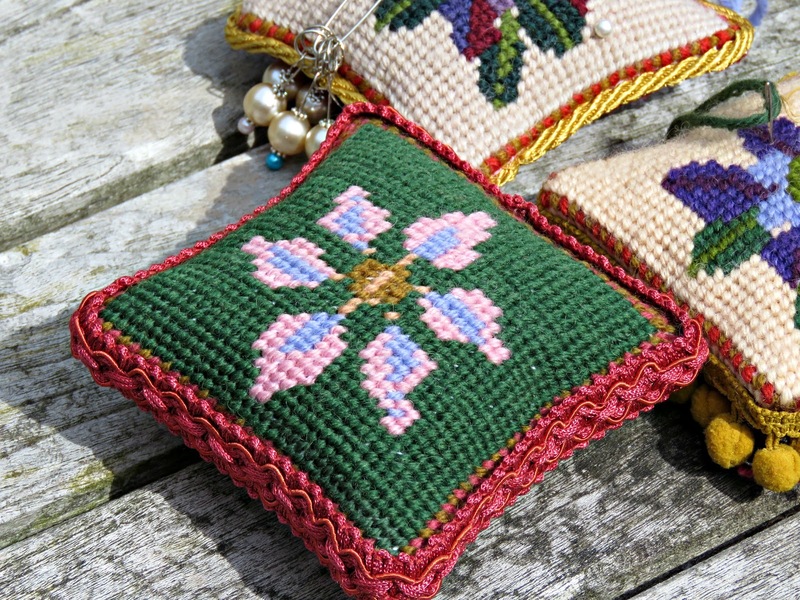 Bonny, how lovely pin cushions! I love cross stitch! 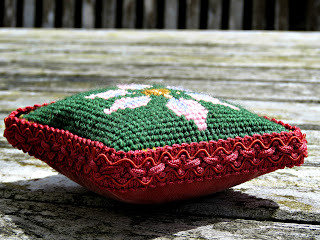 Thank you for the great pattern! Thank you, Mia. So kind of you to get in touch.